Kevin Held, who formed Stage 1 Productions to promote the American Quilt Memorial honoring lives lost on Seot. 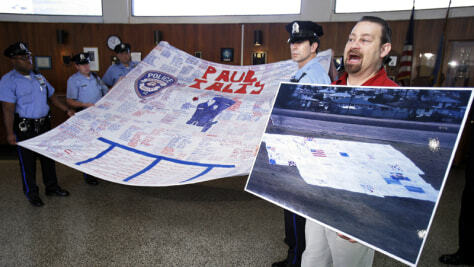 11, 2001, holds up a photo of several quilts next to members of the Philadelphia Police Department in September 2007. An AP investigation has found that that $713,000 held raised for the quilt is gone — and the quilt itself has not been made.